If you’re looking for something special to do for Valentine’s Day 2019, look no further! 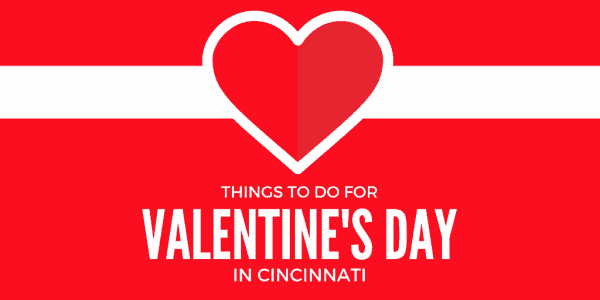 We’ve compiled a list of things to do for Valentine’s Day in Cincinnati – everything from a candlelight dinner to wine tastings and furry Valentines. Enjoy! Plan ahead folks – lots of these will be full by the time Valentine’s Day rolls around AND most of these event required advance registration. Experience LOVE in Loveland with their Progressive Valentine’s Dinner event. Treat your special someone to a unique experience in the land of love. Two packages to choose from. The O.F.F. Winter Market is setting up shop inside Madtree Brewing! Artists, bakers, chefs, scavengers, mobile boutiques, and everything in between will be converging on Madtree Brewing February 9th for the “What Love Looks Like” market. 10am – 4pm. Look for your new best friend at My Furry Valentine – the Tri-State area’s largest animal adoption event. Sharonville Convention Center, Feb. 9 & 10, 12pm-6pm. Admission required. Love is in the air this year at the Cincinnati Zoo & Botanical Garden’s Valentine’s Dinner. Spend your Valentine’s Day at the sexiest Zoo in America! Reservations required. Flowers, Chocolate and Romance at Krohn Conservatory from 10am – 5pm. Cupid’s Undie Run is a “brief” fun run (a mile-ish, at your own pace) party – Undies encouraged, but that it’s not for everyone, maybe costumes are more your style? So whether you start a team with your friends, join a team, or run solo, just come out, have a blast. Look for your new best friend at My Furry Valentine – the Tri-State area’s largest animal adoption event. Sharonville Convention Center, 12pm-6pm. Admission required. Art on Vine: Love Day. Celebrate some lovin’ supporting local artists, crafters and unique hand crafted items. Valentines Treats hosted by Sugar Innovations at Findlay Kitchen. Couples will get an introduction to chocolate covered strawberries, apples, and pretzels. The couple with the best completed design will win a prize. Beer, wine, and appetizers will be provided. 3pm. Galentine’s Day hosted by Cincinnati Girls Pint Out at Samuel Adams Taproom. Join in for a fun evening to celebrate … LADIES ONLY! Sorry men folk! Valentines Barnyard Bonanza at Parky’s Farm. All the farm animals invite you to celebrate Valentine’s Day with them. Includes a craft and time to play in Parky’s Playbarn. Recommended for ages 2-5. Registration required. Galentine’s Day: Join Cincinnati Magazine and the OTR Chamber for a night of sipping, shopping & ladies celebrating ladies with the launch of the Galentine’s Day shopping event! This is a free event but you must register in advance. Tablespoon Cooking Co. is hosting Valentine’s Day Date Night. In this class, you’ll work with your Valentine to make a fun and romantic dinner. At the end, you will all sit down to enjoy the meal. Pharaohs in Love After Party at Cincinnati Museum Center. Step into a time when civilization grew along the Nile and pyramids dotted the skyline. Be among the first in the United States to see priceless artifacts from ancient Egypt dating back over 4,500 years, including the coffin of Nakht, an exceptional bust of the Pharaoh Hatshepsut and an ornate gold and garnet necklace from the Ptolemaic Period. Egypt: The Time of Pharaohs opens to the public on February 15. The Wine Merchant is hosting a special Wine Pairing Dinner at The Phoenix on Feb. 14 (advance registration required). The Cincinnati Ballet presents Sleeping Beauty February 14-17, 2019. Painting night out! “King or Queen of Hearts” hosted by a Stroke of Art. Play with a full deck and paint with a full palette. You pick the King or the Queen of Hearts design. Ideal for couples to paint together, these two paintings create a winning hand! Play in the park after dark for Maple in the Moonlight. Hike the trail, and then warm yourself by the fire to experience the journey of bringing maple syrup to your table. Make a maple syrup-inspired project to take home while enjoying maple tastings and local music. 7pm. Registration required. Experience “The Stars in Your Eyes” at the Wolff Planetarium (Burnett Woods). You’ll hear some of the greatest love stories ever told as we slowly make our way through the seasons. Seating is limited; please call 751-3679 for reservations. Programs are open to adults and children ages 5 and older accompanied by an adult. Fee: $5.00 per person. Findlay Market is hosting a Valentine’s Day Sweet and Savory Stroll. Celebrate Valentine’s Day as a couple, or with friends and family by indulging in scrumptious tasting stations from Findlay Market vendors. Be sure to check your event destination for space and availability before you go as many of these events will fill to capacity long before Valentine’s Day. THANK YOU for including us!!! More than 500 animals will be available for adoption. FREE family fun for everyone!! Prizes, face painters, a petting zoo, lots and lots of dogs, cats and other animals available for adoption. Thank you!!! Of course, if you are tired of couples getting all the attention, join us at our first annual “Singles Awareness Party” at Velocity Bike & Bean in Florence on Saturday night, Feb 14th. Be sure to Save the Date for the Cincinnati Flower Show, ApriL 15 – 19, 2015 at Yeatmans Cove, Cincinnati Riverfront. Be sure to check out The Marmalade Lily’s Galentine’s Day Flower Bar!